If I remember correctly, that was my go-to excuse for not doing my homework. Too complicated. Sorry prof, going to sit this one out. Not the best excuse. But if you’re going to make an excuse, at least stick to it. 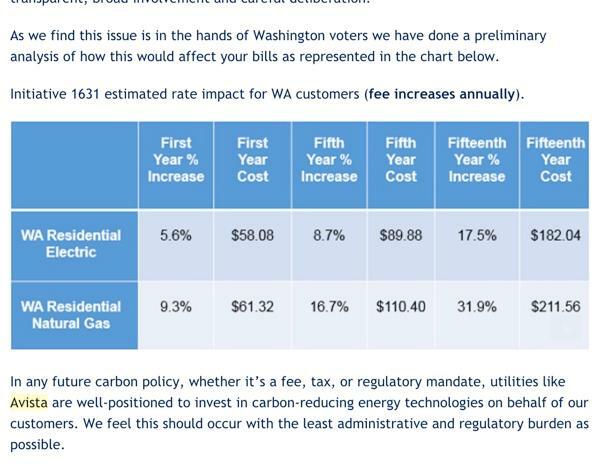 In an email sent to Avista customers Thursday, the utility company starts with the above-mentioned dodge and follows up with a nifty graph showing how much extra money we’d all have to pay if Initiative 1631 passes. It’s true, we will have to pay more if the initiative passes. How much isn’t clear. As Spokesman-Review reporter Jim Camden wrote on Thursday, calculating the exact impact on a user is difficult because of how the fee is assessed. But what is clear is climate change is real. Climate change is happening. And climate change costs money. A 2017 report found that climate change-related impacts – extreme weather, the negative health impacts of fossil fuels – cost the U.S. economy at minimum $240 billion a year for a decade. That number will only grow. To be certain, the exact costs of climate change aren’t clear. Different studies have found different things. As with all predictive science, there is a margin of error that can’t be denied. But it’s clear that climate change is having real and tangible impacts on the economy. The issue couldn’t be more urgent. On Oct. 7, the United Nations’ Intergovernmental Panel on Climate Change found that the globe could warm to 1.5 Celsius above preindustrial levels within 15 years. That would mean rapidly rising temperatures, rising sea levels and severe weather changes affecting millions of people across the world. The U.N.’s scientific panel published the report after 91 scientists, from 40 countries, analyzed more than 6,000 scientific studies. To avoid more serious warming and its various consequences, the global community will need to cut carbon emissions in half by 2030 and be carbon-neutral by 2050. The report wasn’t all doom and gloom. In fact, it laid out tangible real-world ways that warming could be kept within the 1.5-degree range. One of the key steps? Carbon taxing. To be clear, I-1631 isn’t a tax, it’s a fee. But it would raise an estimated $2.3 billion by 2023. That money would go into a Clean Up Pollution Fund. Most importantly, it would provide markets, companies and individuals – and, yes, utilities – with an incentive to reduce carbon emissions and move more aggressively towards energy efficiency and renewables. Just a day after the IPCC report was published, the Yale economist William D. Nordhaus was awarded the 2018 Nobel Memorial Prize in Economic Sciences. His work focused on carbon taxing and its importance to mitigating the impacts of global warming. Scientists who worked on the IPCC report explicitly endorsed Nordhaus’ work. That brings us back to Avista’s email. While the utility says it isn’t taking a position on the initiative, the contents of the email seem to say otherwise. A spokesperson for Avista defended the email in an interview Friday. “We will support the outcome of this regardless,” Mary Tyrie said. “If you’ve looked at the initiative itself, it’s a super-complicated initiative. The primary goal of the email was to let customers know there would be a rate change, Tyrie said. To be fair, there may be reasonable reasons to not support 1631. For instance, opponents question the fact that an unelected board would control the money raised by the fee. Instead, Avista appeals to our general dislike of paying more. While simultaneously stating that they aren’t taking a position. It does so without acknowledging that for years we’ve been paying far too little. For years, we’ve enjoyed cheap power at the expense of the environment and future generations. Climate change is real. Climate change is happening now. And climate change is going to cost us all. How much is up to us. Published: Nov. 3, 2018, 4:33 p.m. Updated: Nov. 3, 2018, 6:09 p.m.